Faraday got a nice few minutes out on the deck last weekend - and a little nip to go along with. 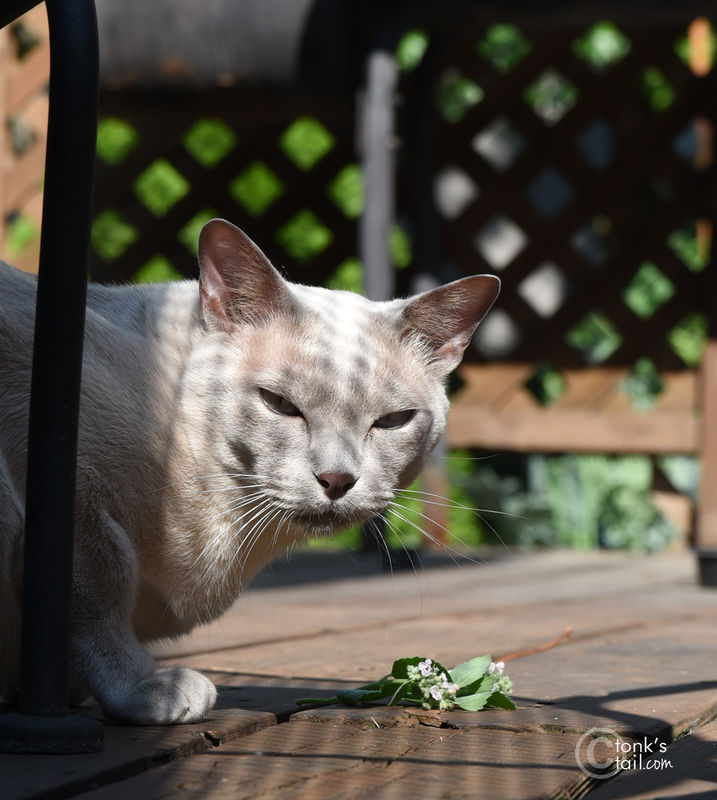 Since he's of the opinion that nothing says summer like a good clipping of fresh 'nip straight from the plant... we couldn't help but participate in today's Photohunt! Faraday: You can go away, now, Mommy, and let me enjoy my nip in peace. That's not "away" Mommy, that's closer. Seriouslies. A little privacy here? To see ore participating Photohunters, check out our hosts at the Whistlestop Photohunt, at this link here! We kitties NEVER get any privacy! Dood, you even got the buds - that's pawsome! You are handsome as well as mysterious! Wow! You were lucky to be able to go out on one of the rare sunny days! Enjoy the nip! You need nipsters anonymous I think! Oh my that is super fabulous way to celebrate summer. Do you get a little silly with your nip, Faraday? Is that why you need some privacy? Nip for you and a mint julep for me! Sounds like the purr-fect summer! Purrs from Deb and the Zee/Zoey Gang! Privacy is essential when you are indulging in nip. Dat looks likes sum pawsum nip gawjus. Hope yous finally got to enjoy it. That says summer like nothing else!!!!!! Oh, there's nothing better than fresh nip! You hadn't better come to my house...I can't grow *anything*!!! I'm one of those kitties who doesn't react to nip. But I can imagine that fresh-cut nip is wonderful and you'd like some alone-time with it.